The Rocky Patel Vintage 1990 Robusto was the 22nd ranked cigar in the world for 2005 by Cigar Aficionado. The 12 year aged wrapper and 5 year filler and binder delivers a mild to medium bodied smoke, with a nutty, caramel essence. The Rocky Patel Vintage 1990 Robusto was the 22nd ranked cigar in the world for 2005 by Cigar Aficionado. The 12 year aged wrapper and 5 year filler and binder delivers a mild to medium bodied smoke, with a nutty, caramel essence. This blend of rare aged tobacco has a perfect balance of flavor, complexity and richness, and is highlighted by a rare 12 year old Honduran Broadleaf wrapper. Through a meticulous aging process the leaf is softened in strength which gaining in complexity and flavor. 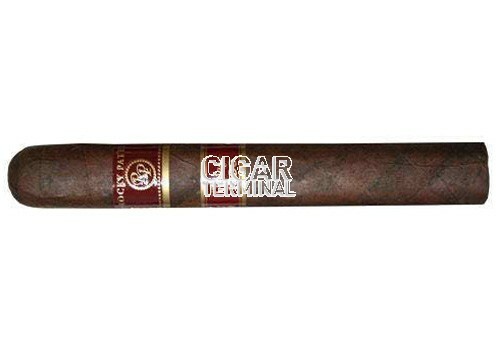 The Rocky Patel Vintage 1990 cigar line has acheived a 92 rating by Cigar Aficionado. Overall a smooth earthy cigar with fine notes of cedar and a light espresso flavor.